The Tillinator is a one of a kind ma- chine giving you the versatility of two. With the heavy duty tiller and heavy duty seed box with cultipacker wheels no job is too big for the Tillinator. Quick attach design allows you to use the tiller or the seeder units independently or together. A hunter’s dream come true! 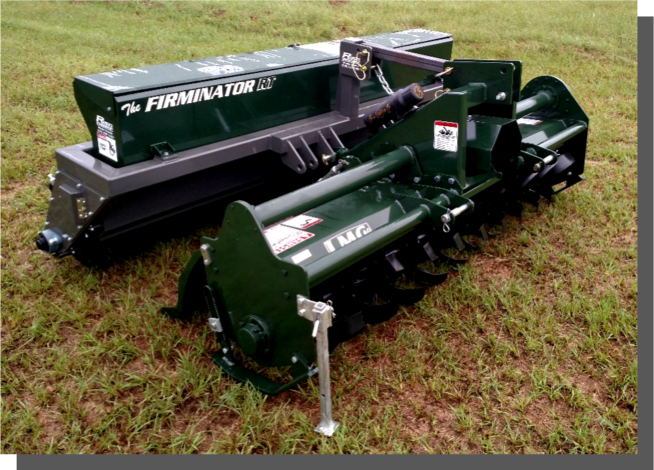 The Firminator is the ideal machine for your food plot planting needs. With its adjustable gang arm disc and Accu-Seed System for planting the tiniest of seeds up to corn, soybeans, peas, sunflowers and everything in between! It’s the ideal machine for large land ownersand the determined hunter.